Karnataka farmers agitation Updates: The chief minister was to meet the farmers who were agitating over non-payment of sugarcane from mills on Monday. However, it was reported that the visit was cancelled and was rescheduled for November 20 in Bengaluru. 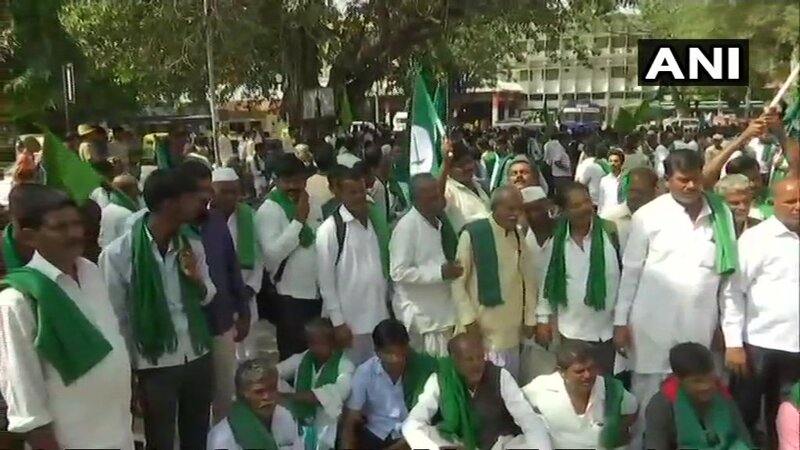 A protest by farmers over non-payment of dues by sugarcane mills took an ugly turn after Chief Minister HD Kumaraswamy cancelled a meeting scheduled with the protesters for today and referred to them as “goons”. Farmers were left outraged and have intensified their protests in Karnataka after the Chief Minister on Sunday accused them of defaming the entire farming community. The Chief Minister made this statement after a group of farmers gatecrashed into state legislature complex protesting Kumaraswamy’s move of canceling his visit to meet them. The Chief Minister was to meet the farmers who were agitating over non-payment of sugarcane from mills on Monday. However, it was reported that the visit was cancelled and was rescheduled for November 20 in Bengaluru. For the last few days, farmers in Belagavi have been demanding their pending arrears by sugar mills for the cane supplied to them. Farmers in Belagavi have been protesting for the last few days demanding clearance of their pending arrears by sugar factories for the cane supplied and announcement of purchase price for sugarcane for the current season as had been done in neighbouring Maharashtra. They had withdrawn their protest on Friday claiming that the chief minister has agreed to meet them in Belagvai Monday to discuss their issues. Driving trucks with sugarcane, a group of farmers Sunday 'gatecrashed' into 'Suvarna Vidhana Soudha', the legislature complex in northern district of Belagavi protesting Karnataka Chief Minister H D Kumaraswamy's reported cancellation of his visit to meet royts agitating over payments due from sugar mills. In a strong reaction, Kumaraswamy described those who barged into the legislature complex as 'goondas' and accused them of defaming the entire farming community. If dues not cleared, the farmers have threatened to disrupt the winter session of the state legislature scheduled to be held in Suvarna Vishana Soudha next month. The farmers are demanding clearance of their pending arrears by sugar mills for the cane supplied. Chief Minister HD Kumaraswamy will be in Bengaluru on Monday for various meetings including a cabinet meeting, PTI reported. Earlier, he was scheduled to visit Belagvai to meet agitating farmers on November 19. But, the visit was cancelled and rescheduled to Tuesday in Bengaluru. A PTI report said that farmers had withdrawn their protest on Friday claiming that the Chief Minister had agreed to meet them. However, the reports of cancellation irked them and about ten farmers broke open the gate of Suvarna Vidhana Soudha and took four trucks inside the premises. A PTI report said that farmers are demanding clearance of their pending arrears by sugar factories for the cane supplied. They are also demanding announcement of purchase price for sugarcane for the current season. Farmers have cited Maharashtra government's decision as example to declare the purchase price of sugarcane in advance. According to police, about ten farmers in four trucks forcefully entered the Suvarna Vidhana Soudha, but all were detained and the vehicles removed immediately. Reacting to this, CM Kumaraswamy described those who barged into the legislature complex as 'goondas'. He even accused them of defaming the entire farming community. The farmers under banner of different organisations are protesting outside Vidhana Soudha demanding correct support price among other things. The farmers in Belagavi have been agitating over non-payment of their canes by sugar mills. Earlier, the farmers had threatened to disrupt the winter session of the state legislature scheduled to be held in Suvarna Vishana Soudha next month.